I decided to take part in the Transformation Challenge because I gained some extra weight due to a medication I was taking. After stopping the medication some of the weight came off easily, but some stuck around. My exercise routine was not enough to get rid of the extra pounds without changing my diet so I thought this was a great opportunity to lose the weight more quickly than trying to make nutritional changes on my own. The Transformation Challenge was very structured which I think helped me stick with it. There was no wiggle room. The variety of food was limited which made it easy to follow and made for a shorter grocery list. It took my body a while to get comfortable with the reduced calorie count. 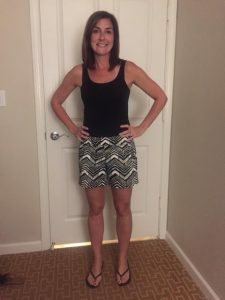 Sharon helped me get into a better routine by suggesting I try moving the meals around as well as my workouts until I figured out what worked best. I lost 7 lbs. and 9.5″. I reached my goal in 5 weeks and am thrilled with the results.